Sometimes things happen in the real world that are so weird, you really wouldn’t write about it. Because who would believe you? Social media supporting protests in countries everywhere – especially the Middle East. All quite bizarre at times and terribly, terribly modern. Or not. These are extensions of activities that have been central to the life of a great deal of the world for centuries – millennia. Granted, there weren’t too many bloggers in Damascus in the seventeenth century, but there have always been rabble-rousers, trouble-makers, idealists and writers whose words have spread far and wide, whose ideas and discussions have ignited unrest or provocative debates or even revolutions. Socrates. Luther. Spinoza. Galileo. Jefferson. Those kinds of ratbags. You know where I’m going with this. People have always dreamed and written and published their thoughts and beliefs and aspirations, whether on clay tablets or parchment or – in recent centuries – in mass media such as the pamphlets that swirled around London in the 1640s or Paris before the Terror. For everyone one of those ratbags, there’s someone trying to shut them up – or down: authorities burning books or burning authors, excommunicating or exiling people, throwing authors and teachers into prison or camps or dungeons, banning books and media outlets. In many of the countries in the world today, the situation is not so extreme. But let me just unpack that: I was going to write “most countries” but then realised, I don’t even know if that’s true, numerically. There are writers, journalists, artists, bloggers, whistle-blowers and teachers in prison or exiled or in danger in dozens of countries around the world right now. Even in the liberal democracies, the immediate political response to a Wikileaks or a controversial artist is banning. Often it’s just a play to the tabloids which, as we know, are peerless upholders of intellectual integrity. Even in the liberal democracy in which I live, Australia, there’s no constitutional right to free speech. In the media, slippery slopes head off in all directions. Anyone, like me, who has spent any time in commercial media – print or online – can tell you that every day, every week, is a battle between editorial and sales/marketing teams about what messages are acceptable, from the annoying pop-up ad campaigns on your website to the pressure not to report on certain issues, or not to publish letters critical of advertisers. In too many countries, that pressure is about not being critical of authorities or political movements or organised crime or businesses or religious leaders – and in far too many places, you ignore that pressure at your peril. Yet people still do. And many still die. 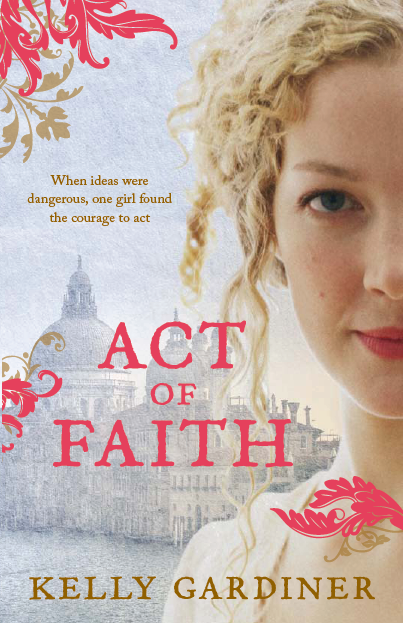 Yes, this is what my novel Act of Faith is all about. It’s set in the 1640s, when the Parliament in England and the Catholic Church in Rome were as keen on burning or jailing dissidents as each other. When I wrote it, I knew there were parallels happening around the world – what’s fascinating is how many of the debates are now at the forefront of public discourse. Or they should be. What does freedom of the press really mean? How do we ensure freedom of expression, and of belief, in a multicultural/transnational publishing world? What freedoms should be embedded in the fabric of a free and independent nation? Everyone has the right to freedom of opinion and expression; this right includes freedom to hold opinions without interference and to seek, receive, and impart information and ideas through any media and regardless of frontiers. – Universal Declaration on Human Rights.